Being in the field of a midwoof I have heard and have been involved with a few stories about large litters. The stories have different outcomes depending on the breeders, the vet and their responces to the situation. I will share some of them on this page. A toy breeder called to say her dam had an x-ray and was carrying 10 puppies, double the average amount for the breed. 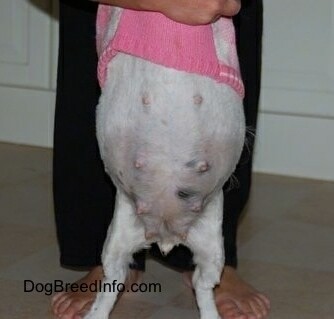 The vet told the breeder to wait until the dog went into labor and to monitor her. 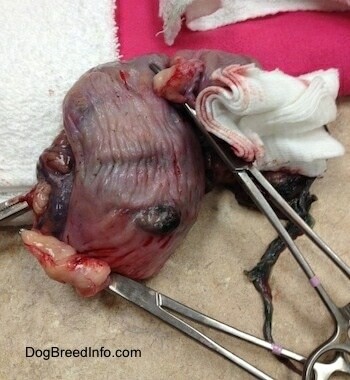 The breeder was experienced and she knew her dog, who was having trouble breathing and she knew this was not good. On the dam's due date the breeder really wanted to have a c-section performed and take the puppies out, however the vet assured her all was fine. He told her no dog ever dies from carrying too many puppies. The vet was sadly mistaken, dams do die from carrying more puppies than their bodies can handle. The breeder was told to wait until the next day. She went against her intuition and waited. The next morning the dams uterus was so stretched and thin that the puppies came out of the side of the uterus instead of the birth canal. The dam and all 10 puppies died before the breeder could get them into the car for the 5 minute drive to the vet. The mother dog was carrying double the amount of puppies for her breed. She had been taking the dam's temperature and she knew the puppies were coming. In hindsight she knows she should have demanded an emergency c-section be done on the dam. In another case a toy dog was carrying 9 puppies. She went into labor and pushed for an hour with no results. The breeder rushed the dam off to the vet just in time. The dam's uterus had ruptured and she almost died but the vet was able to save her and 4 out of the 9 puppies. 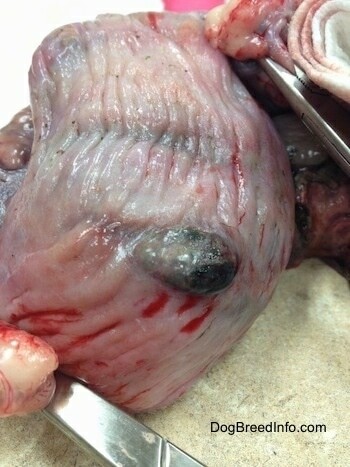 The dam was spayed, her uterus removed. Without the quick response from the breeder and the vet the dam would have pushed the pups into the side of her uterus and she would have bled to death and all of the pups would have died. In both cases above the breeders did not take pictures, but they described the pups similar to this one; very green with white tongues. The placentas were breaking down. This picture is from a story about a dam who was starting to absorb her litter. This toy dog is on day 50 of her pregnancy. She is already huge and still has 10 days to go. In those 10 days puppies usually double in size and this is a big cause for concern. If this were a human the mother would be in the hospital, bed ridden, hooked up to all kinds of machines and the minute one of the babies was in stress she would have a c-section performed. This breeder is going to have to be very careful with this dam. What she does will have a huge impact on the survival of the dam and puppies.